As the weather gets warmer and the sun is out longer, everyone is excited to get out of the house and spend more time outside. Unfortunately, for our pets, this includes parasites. I’ll go over the most common parasites seen in the clinic in cats. Roundworms are most commonly found in kittens and cats that go outdoors. The cycle starts when a cat eats roundworm eggs that contain larvae. These can be found in the soil, as well as in intermediate hosts such as birds, rodents, and insects. These eggs hatch in the intestinal tract. The larvae then move into the bloodstream and travel through the body into the lungs. Once the larvae mature, they are coughed up and swallowed, and make their way back to the intestinal tract where they feed and reproduce. New eggs leave the body when the cat uses their litter box. Kittens are most commonly infected when they nurse, as larvae can be transmitted through infected milk. While it is uncommon for indoor only cats to be infected with roundworm, they can be infected from eating an intermediate host (bird, rodent, or insect). Or from sharing a litter box with a cat that is already infected with roundworm. The infectious eggs are ingested when they groom. Symptoms of roundworm include vomiting, diarrhea, weight loss, poor appetite, and a dull coat. Kittens usually have a distinctive pot belly (commonly called a worm belly), but otherwise, look thin or malnourished. Hookworm eggs and larvae are found most commonly in warm, moist, environments and can persist in the soil for weeks or months. Cats can be infected by ingesting larvated eggs when they groom, or from larvae burrowing through the skin and making their way to the intestinal tract, where they mature into adults. As with roundworm, kittens can be infected when nursing, and indoor cats can be infected from sharing a litterbox with an infected cat. Symptoms to watch for are anemia (hookworms take a blood meal), poor hair coat, digested blood in stool, and skin irritation from migrating larvae. Hookworm is zoonotic—it can pass from animals to humans. People usually pick up hookworm from walking barefoot on beaches in tropical locations. It causes a condition called cutaneous larva migrans, and there are distinct red track marks that are visible where the larvae have travelled through the skin. This condition is self-limiting, as humans aren’t the natural host. The most common way for cats to get tapeworm is by eating fleas! It is because the flea is the last intermediate host for many species of tapeworm before they mature into adults in their natural host—in this case, your cat. It is very common for cats to get tapeworm after a flea infestation. Symptoms of tapeworm infection include weight loss, vomiting, seeing rice-like segments called proglottids in the stool. Occasionally, a cat will vomit up a live tapeworm, which can be quite a shock for the owner! Fleas are one of the parasites we see most frequently in our patients. 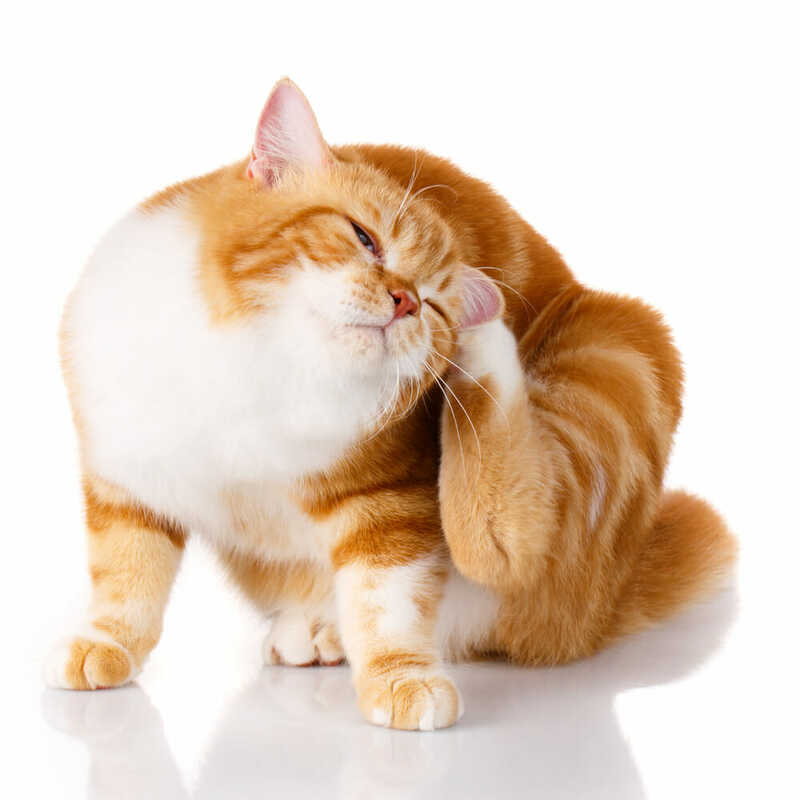 While we usually see fleas on indoor/outdoor cats, we also see them on cats living in apartments or indoor cats that live with dogs. In these cases, the cat picks up fleas from other animals in the apartment building who bring them in, or from their dog companions. Many people don’t realize that even if their animal doesn’t go outside, other animals can bring fleas into the environment. Adult fleas can be seen relatively easily on animals, but it is important to remember that eggs and larvae are present in the environment. It is why fleas are so persistent. It can take three months or more to clear up a flea infestation! Symptoms to watch for are itchiness, scratching, excessive grooming, hair loss and scabbing/skin irritation. So, what can you do if you are concerned about parasites? Bring your cat into the clinic to see your veterinarian. He or she will perform a full physical examination as well as go over treatment options, diagnostic tests to identify potential parasites, and strategies to prevent parasite infection or infestation in the future. If you have any questions or concerns, your veterinary team will be more than happy to answer them for you!